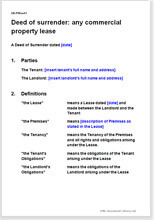 Surrender document to terminate any commercial lease by mutual agreement. Includes optional provision for payment by one party to the other and for all obligations to cease. A surrender may be immediate and simple, but in many cases the Landlord will want to be sure that the Tenant leaves the premises when required and in the condition required by the lease. This surrender document covers the Landlord's position thoroughly. Note that the conditions imposed by the Landlord in return for a payment might be anything. We have provided here a template which can be used flexibly.